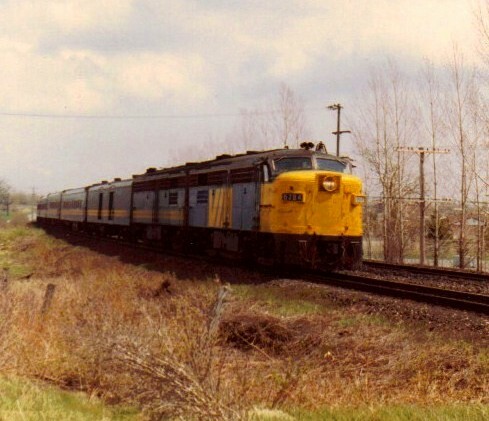 From 1977 to 1979, the look of VIA trains was changing radically. From mixed CN and VIA consists, to VIA-painted cars and locomotives, with the latter dominating each consist. In 1979, I'm starting to come across "All VIA" trains. Sometimes, in a moment of bilingual patriotism, I had recorded "Toute VIA" along with the train information. And the horsepower! One train notation: 5400 hp for six cars - that's three smoking MLW's. Two are shown above in 1984. How about five RDC's on the Ontarian, running between Kingston and Toronto, with a nice mix of RDC types? It was an interesting period in VIA's history. I have transition data for the RDC's too, including when each received VIA stripes and yellow ends. Highball!